Myrnah and I are still waiting for this foal. I think we have a couple more weeks to wait, yet this stage of pregnancy and the waiting involved seem to be stressful for both Myrnah and me. My mare who has been so rock solid through all the life changes we have experienced together is all of the sudden a different horse. When stress levels are up, life’s simple occurrences can cause an unwarranted intensity of reaction. The birds fluttering in and out of the bushes used to be a back drop for life, now who knows which bird is going to cause Myrnah to jump out of her skin, heart racing, causing both of us to search high and low for the saber-toothed tiger that must be lurking nearby. Looking for that tiger every few minutes is exhausting and stressful all on its own. Holding a level of tension that makes hyper vigilance, shock, and reaction likely is not a fun way to live. All other goals aside, this week has been simply about playing with stress. What can we do to lower the stress and make life easier to live in these last weeks of Myrnah’s pregnancy? There are three solutions I know of to lower stress: movement, stillness and connection. 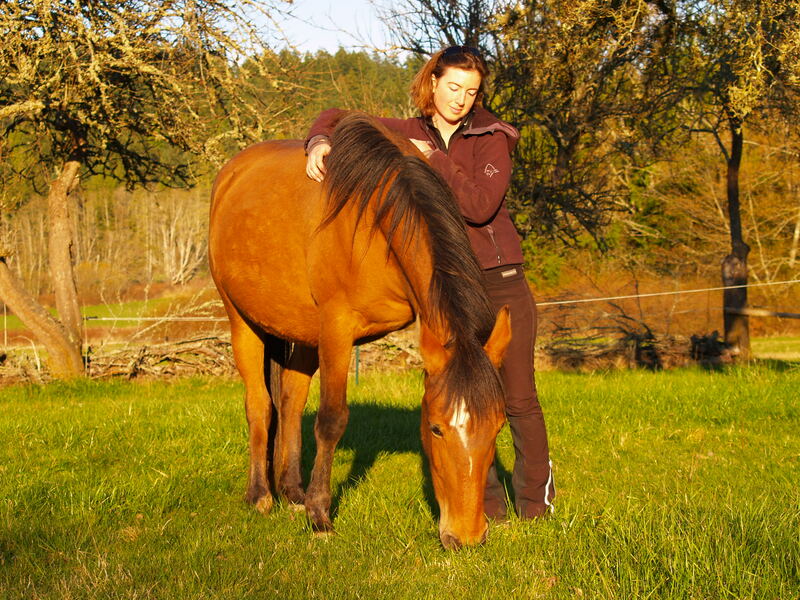 As Myrnah becomes larger and her physical comfort decreases I think she moves around the pasture less. When she becomes still that baby is still dancing a salsa inside her belly and being utterly distracting from any sense of quiet or peace. Adding to those two factors it becomes more and more challenging for Myrnah to connect with me, or the herd, if she feels stressed, reactive, hyper focused on perceived danger, or spacey and unfocused in a rebound from being hyper focused a moment before. What is stress? I think emotional stress is simply the energy you feel when life isn’t the way you want it to be, and you feel powerless to change it for the better. Stress can be good and it can be bad; the trick is to play with it in a way that brings the most benefit possible. We stress a muscle to make it stronger. We can’t make a muscle stronger without the stress to motivate change. Stress too much and you create injury; stress too little and the resulting change is little to none. In order to play with emotional stress we need to look at it the same way we look at the physical. Myrnah is going through huge physical changes right now; her physical stress and her emotional stress are all intertwined. So the question for me is: what can I do to help Myrnah feel a personal power to make her life better? Movement, stillness, and connection- first things first, we move together, side by side, shoulder to shoulder; we walk as far and as quietly as we need to. Doing it together gives us both a sense of connection. When that bird, dressed as a saber-toothed tiger, comes out of the bushes at us, after the reactionary leap we practice stillness for as long as Myrnah needs. Her ears pricked, eyes scanning every shadow for possible danger, she just needs to be still until she feels safe enough to move again. Once her heart rate has calmed and her hyper vigilance softened, we move again- step for step, each moment of rhythmic footfall bringing confidence back into the picture. When I show up in the morning and Myrnah and I take our customary walk to the trailer for breakfast, some days she is connected and calm, and the trip takes only a moment. 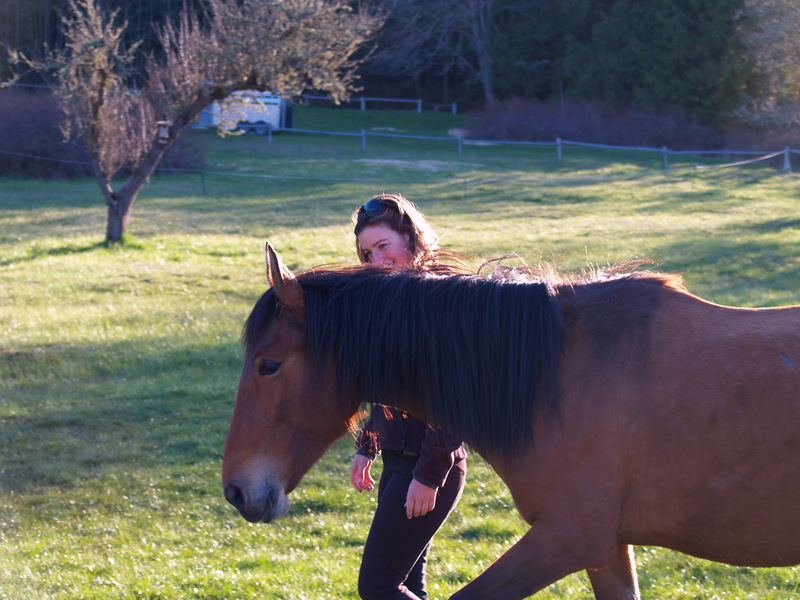 Other days, if Myrnah is stressed, it can take up to an hour to travel the hundred steps from the barn to the trailer as we weave loops and circles, double back, and start again, movement and stillness alternating until she has the confidence to walk that short distance up the hill. Some mornings she stomps in the trailer and eats her handful of vitamins with gusto; some mornings all she can manage is a bite before she bolts out of the trailer telling me she is too worried and stressed to eat. So we walk some more, and rest some more, and I let her know I am there for her. Whether she feels connected or not, I am right there for her to connect with any time. Once we have walked for long enough, and the emotional stress has lowered, she can then walk into the trailer, finish her breakfast in peace, and we are ready to move on to other things. 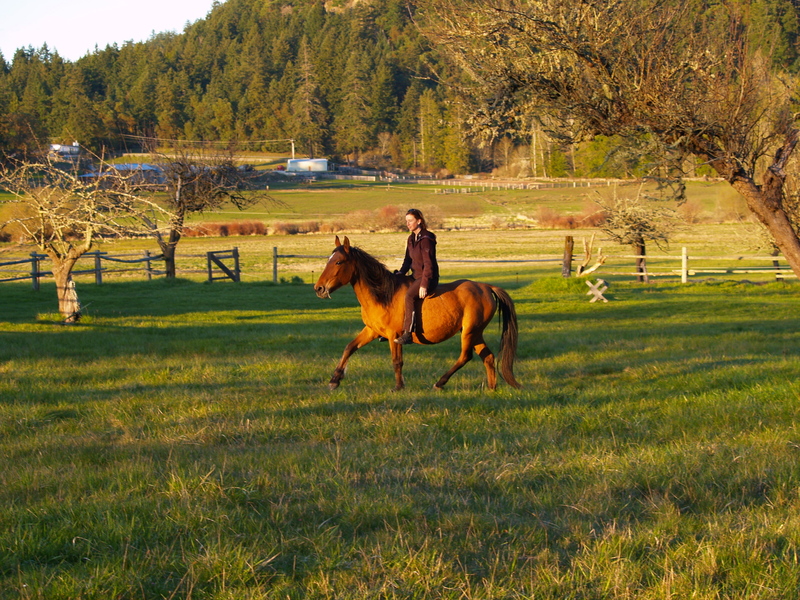 I long for the calm and steady mare I brought home with me from southern Oregon in August. Yet I have to trust that making it through the stress she feels now in these last weeks of pregnancy is going to make us stronger together. It isn’t her fault that she feels the way she does. The changes she is experiencing internally are huge. If I can help her learn how to move and be still and connect in ways that lower her emotional stress, then hopefully the physical changes that she has no control over will be building and strengthening instead of overwhelming. This week has been about playing with stress. The best way I know to lessen the negative consequences and increase the positive are to make it a game. Life is supposed to be fun as well as challenging. In life, change is the one thing you can always count on. No matter what a moment feels like, it is momentary. Without fail, given time, all things change. Myrnah and I find ourselves this week in the waiting game. Two weeks ago we were reveling in breakthroughs of speed, developing forward and playing with comfort in movement. One week ago everything seemed to slow down abruptly. I wasn’t sure if it was Myrnah or me slowing us down. Her belly keeps getting bigger making her movements increasingly ponderous and all last week I found myself fighting a flu bug. 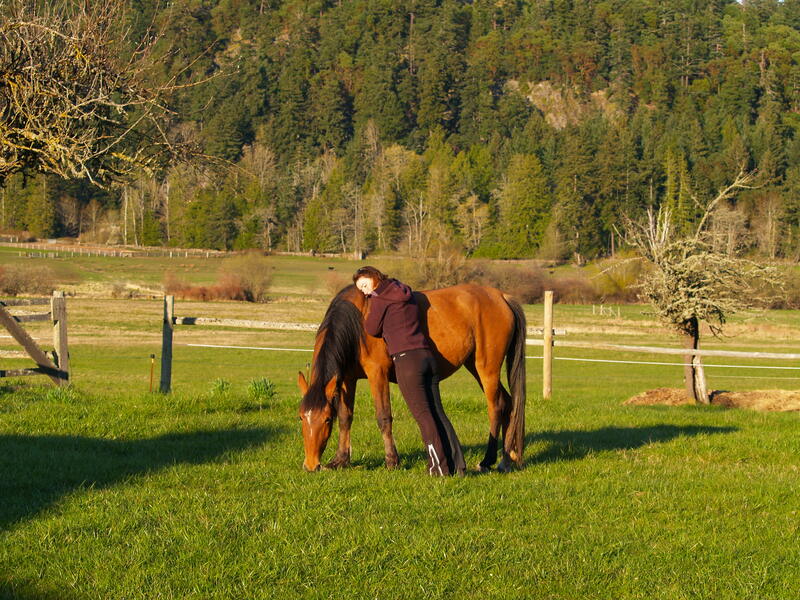 By mutual consent our week’s work consisted of more time spent relaxing together than anything else, Myrnah grazing and me quietly still with my eyes closed. That is why the blog last week was about Cameron and Antheia, with Myrnah and I existing simply as inspiration. This week everything has slowed yet another notch. Myrnah’s belly has gone from a high, toned, fit look, wide yet still athletic, and progressed into the next stage with the baby hanging lower each day. She seems to have entered that stage of pregnancy where you think the belly can’t possibly get any bigger; this baby has to be coming soon! Yet you know from seeing other pregnancies, there is still a ways to go- that foal will just keep on growing until it is ready, and, comfortable or not, Myrnah will continue to carry it as it seems to get impossibly big. It is a waiting game now. Being a trainer with a plan and a mother who remembers longing for distraction in those last weeks of pregnancy, practice of skills continues for Myrnah and me, just slowed to a snail’s pace. We still spend hours together every day, walking side by side, practicing her turns and her responsiveness to fingertip pressure on the sides of her neck. 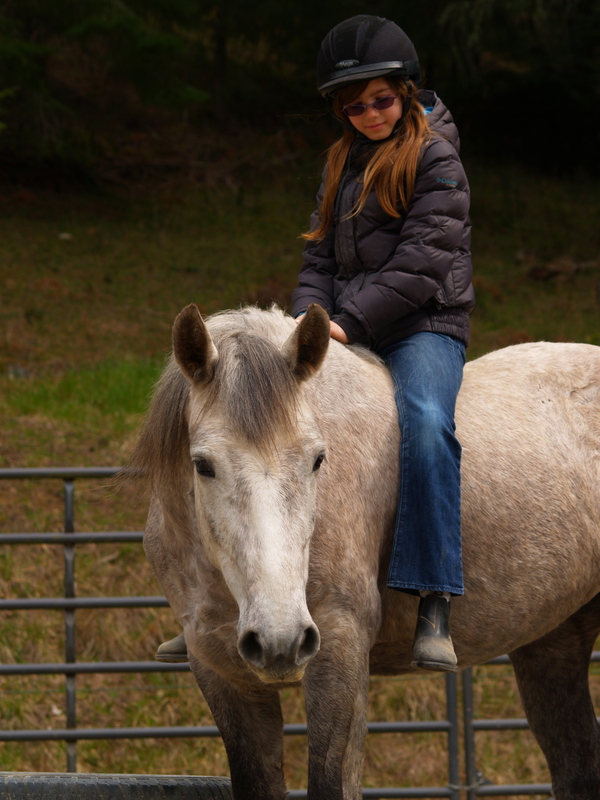 I still ride a little, though less and less as Myrnah makes it clear it isn’t comfortable for her any more. Sometimes as I swing a leg over her back she stands solid and calm, so we walk for a bit, making progress in small parts of our training like traveling farther and farther from the barn up the hill towards the trails, opening a gate while mounted, walking into the trailer while I am riding- distracting, fun, quiet activities. More often however, Myrnah’s neck and back tighten and I jump directly off. If I stay sitting on her when I feel that tight resistance, it is followed by a staggering awkward step off to the side confirming for me that Myrnah needs to be babied a little more in these last days of carrying the new baby. I want to do more and Myrnah is restless, like she wants to do more too, yet the changes keep coming with more and more signals for us to slow down and be patient. Myrnah seems unusually spacy and unfocused. Getting her attention for a task requires increasing amounts of effort and persistence on my part. She has gotten jumpy and easily surprised, occasionally leaping to the side, eyes wide, heart pounding a million beats a minute, her entire body tensed for flight. I look for what could have caused the fright and can see nothing; so we stand together breathing deep until it passes and she can go back to grazing and walking with me. I think perhaps sometimes the startle is in response to something internal for Myrnah. Sometimes I can see that baby goes quickly from so still to dramatic movements that rock Myrnah’s entire frame, forcing her to step her feet wide and brace against the earthquake in her belly, as if this baby also grows tired of the waiting game. Nonetheless, wait we must- Myrnah, the baby and I.
Myrnah is a wonderful combination of social and comfortable alone. Her days are spent out in the large pasture with the herd. Grazing nose to nose with the big gelding Ram, or bossing around the other mares, Myrnah seems at ease with the group. She is surprisingly dominant when horses are grumpy, as though she agrees with me that horses just need to move their feet to find their way from grumpy to happy. Her bossiness seems more like a public service than a personal agenda. She isn’t aggressive, just friendly with everyone. If they choose to be less than friendly with her, well then obviously they must need a little movement to feel better. Every night she comes into the sheds and grass paddocks behind the barn- a special feed of hay and the beautiful lush green foaling paddocks all to herself. I am impressed she doesn’t seem to mind being alone at all. Each morning when I arrive she is standing quietly sleeping or grazing. A walk to the trailer for snack, a grooming, an hour of playing with me on small development tasks, and then I put her back out in the big pasture with the herd. Maybe tomorrow I will arrive to find two where there once was one. I think though, we still have a ways to go. This waiting game must be played; change comes when it does, and this baby has a timing all its own. When I began this project with Myrnah I imagined it as an isolated project. Interesting, yet separate and completely different from the rest of the training and teaching I do. Never have I been so thrilled to be wrong. Instead of the project being separate and different, I find the things Myrnah teaches me permeate and improve everything else I do. Myrnah’s gift to me, showing me a relationship with horses from a completely different angle, seems to spread all through my work like ripples in a pond. 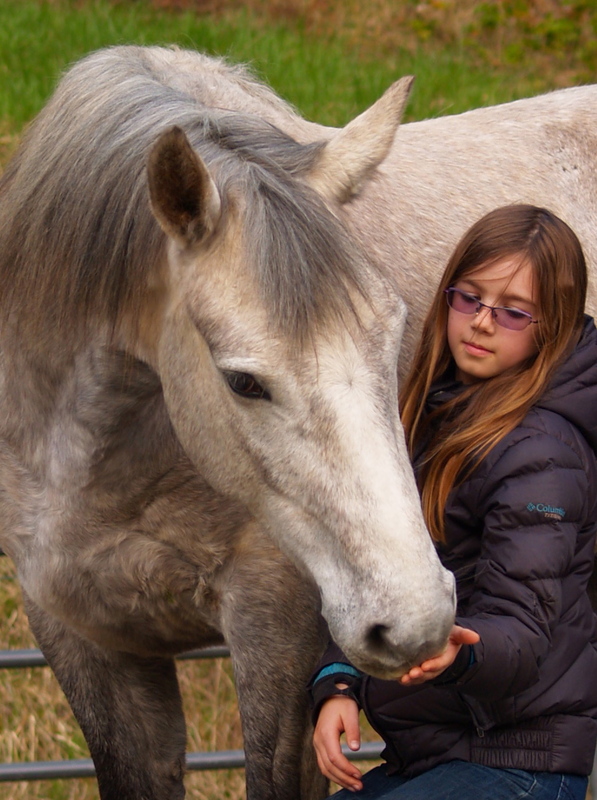 The developmental processes Myrnah has helped me learn, the processes that I didn’t have a year ago, profoundly benefit the horses and the people I come in contact with everyday. So any of you who get to work with me, next time we have a great session together, Thank Myrnah! This week, with its beautiful sunny days, white puffy clouds, and a school vacation, brings me to tell you about Cameron and Antheia. 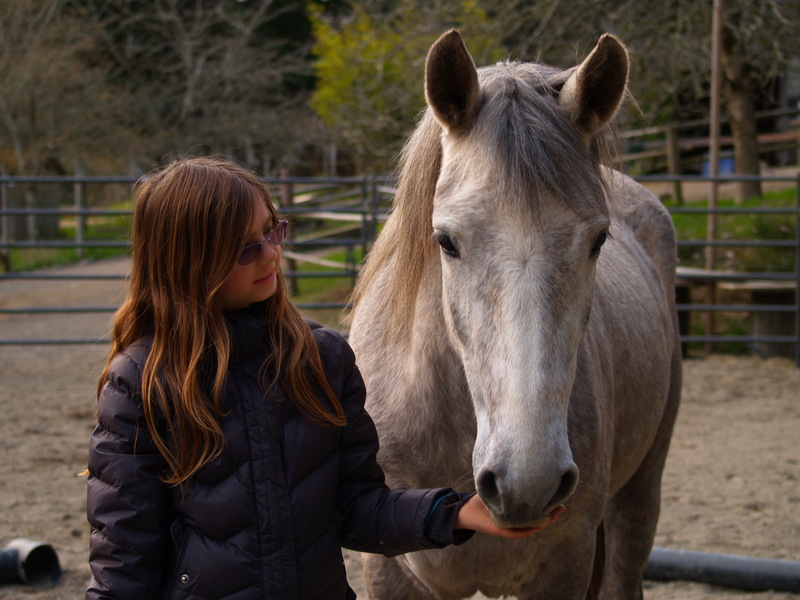 Cameron is my daughter, ten years old, and loves horses just about as much as I do. Antheia is the grey mustang filly coming three years old this spring. Thanks to Myrnah’s inspiration, this week was truly special for Cameron and Antheia. Antheia and Cleo are the only two horses still living in the paddocks at my house. The pastures down in the valley with the lush abundant grass are a wonderland for any horse getting enough exercise to work off the sugar. For the horses not yet under saddle, all that food can be too much of a good thing… so for now Cleo and Antheia stay in the upland paddocks close to home with Cameron and me. Antheia is a love- innately social with a playful mind and a steady disposition, eager for anything new and fun the world can bring her. 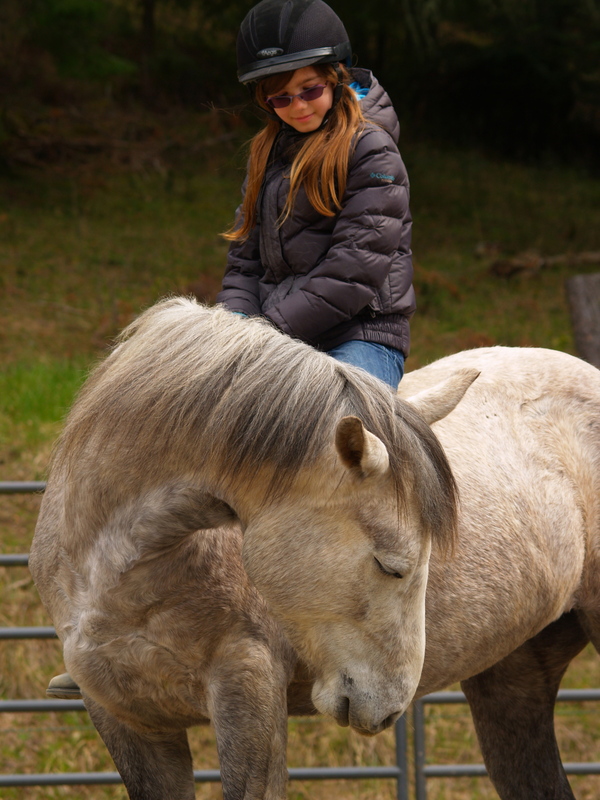 At close to three-years-old I wasn’t in a hurry to start her riding career; however, I knew she and Cameron would both enjoy the development process immensely. So with the combination of sunny days, time on our hands, and Myrnah’s gift of inspiration, I broached the idea to Cameron, and the game was on! Day one: Cameron groomed Antheia loose in the paddock and then I talked her through the drive and draw process Myrnah and I use. Slowly and patiently Cameron used the pressure of moving in and out of Antheia’s space to create the magnetic draw bonding them together. I was surprised how hard Antheia made Cameron work for it, and I was impressed with Cameron’s perseverance as she developed her timing to attract and draw Antheia with her. Once they made it to the round pen together, Antheia following Cameron freely at liberty, Cleo and I came in too and helped speed the process along. The game was for Cameron to use as much drive and draw and patient persistence as she felt good about. If it felt like Antheia was not holding up her side of the equation- drawing to Cameron- then we could switch games, sending Cleo and Antheia out to take a run around the round pen together, knowing Antheia would be much more interested in working with Cameron once she knew the alternative. My work with Myrnah has encouraged me to minimize sending horses away, pushing them to move because they are trapped between a fence and me. Nonetheless, tools like a round pen were created with good reason- they speed up the process. Not everyone has the time and the patience to take the slowest road of development. Cameron and Antheia’s work this week was inspired by Myrnah, yet tailored for them. 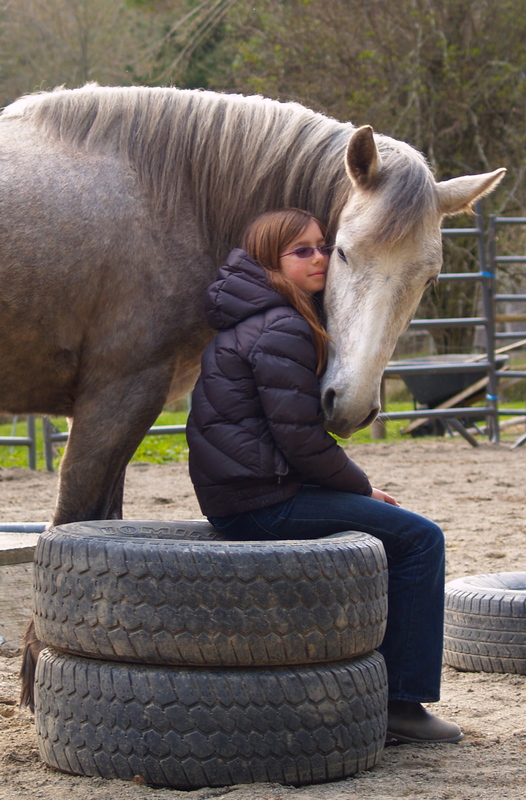 By the end of day one, Cameron had taught Antheia to draw with her and find a resting spot next to the tires stacked as a mounting block. Day two found the draw a little easier between them, and a comfortable ease with Cameron climbing up on the makeshift mounting block to stand up high over Antheia’s back and belly over, letting Antheia feel weight for the first time ever. Day three graduated naturally to Cameron swinging a leg over and sitting high, Antheia carrying a rider astride for the first time. Day five the draw between Cameron and Antheia was almost effortless, so they added to the groundwork the practice of pressure on Antheia’s side to mean move forward, linking beautifully with the riding. By the end of day five Cameron could ask for a walk with the nudge of a heel, and Antheia was happy to oblige. 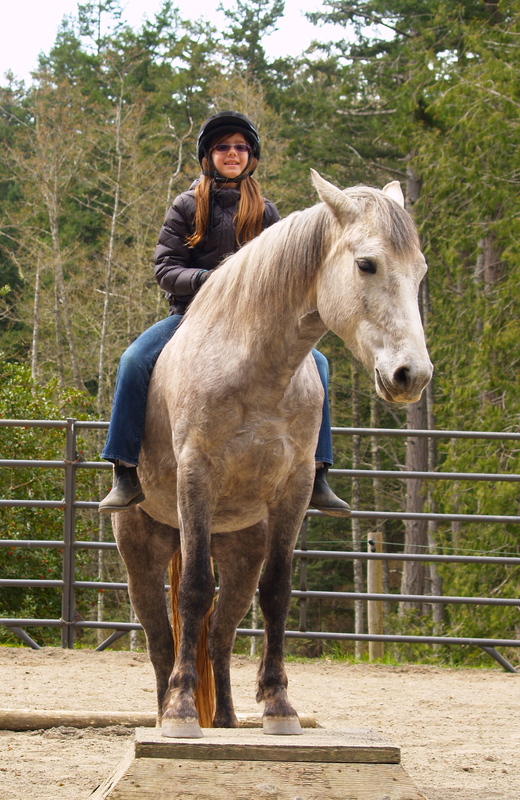 There is something special about starting your first horse under saddle; it is an experience you don’t forget. Thanks to Myrnah, Cameron and Antheia took that experience up a notch- no saddle and no bridle or halter, just an understanding between them. I got to watch from the sidelines, simply offering words of encouragement and shining a light on their path. I sat on the ground, Cleo standing guard over me as I snapped photos and reveled in watching another horse and rider experience the inexplicable joy that comes with building a bond and doing something new together. There is really nothing quite like it. Myrnah’s gift I think is really about realizing how powerfully rewarding it is to do things with more trust and less force. It may take longer, it may feel harder, it may seem pointless at times, but there is nothing comparable to the feeling you get doing something new, knowing your partner wants to be there with you. Nothing is holding you, but the desire to be there together. First rides at the canter this week! I had no idea how long it would take to get this far. Our progress, if measured against more normal training, might be considered inordinately slow. However, if measured against all the possible difficulties Myrnah could throw at me, I think we actually are developing forward at lightning speed. While I do believe people have trained horses without tools before, this is the first time in history anyone has recorded the process: writing, photographs, and video, week by week, noticing the landmarks and breakthroughs along the way, and charting the previously uncharted path. 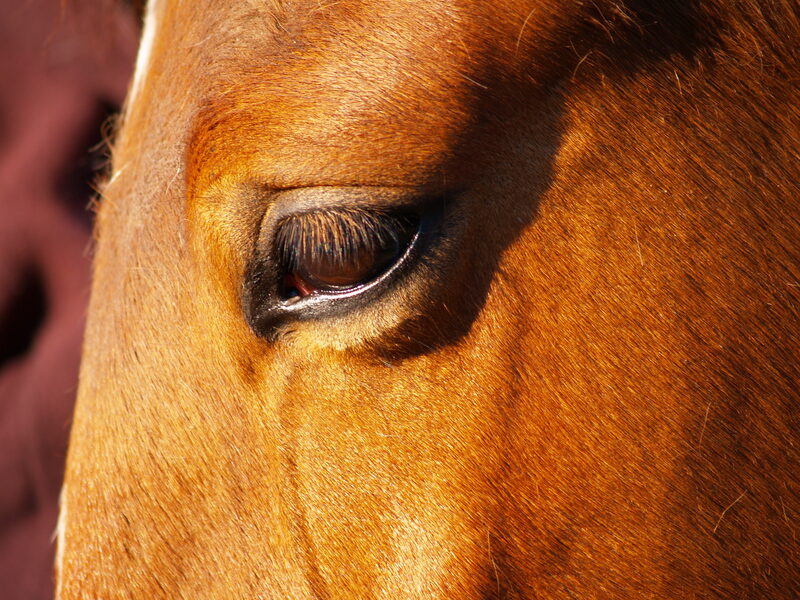 I am not sure people realize how challenging it is to train a horse when they are free to leave you at any time. So many times it has been tempting to cut Myrnah off, step in front of her when she is trapped between me and a fence, make it clear to her I am in charge; or even step behind her and send her forward with energy because she knows she has nowhere to go but forward. I could show her I am smart enough with my positioning and fences to intimidate her. That is not this project though: time and again I take a deep breath and get between her and the fence, making sure that when I push her, she has a choice to stay with me or move away into wide-open space, leaving me behind. When I ride Myrnah I need permission to climb up on top, and, if she wants me off, both of us know it wouldn’t take much of a run and a buck to convince me I didn’t want to be up there any more. In everything we do together, Myrnah knows she can say no; and what’s more to the point, she often does. So when I say she carried me at the canter this week, I am beyond thrilled she felt comfortable enough to offer that. 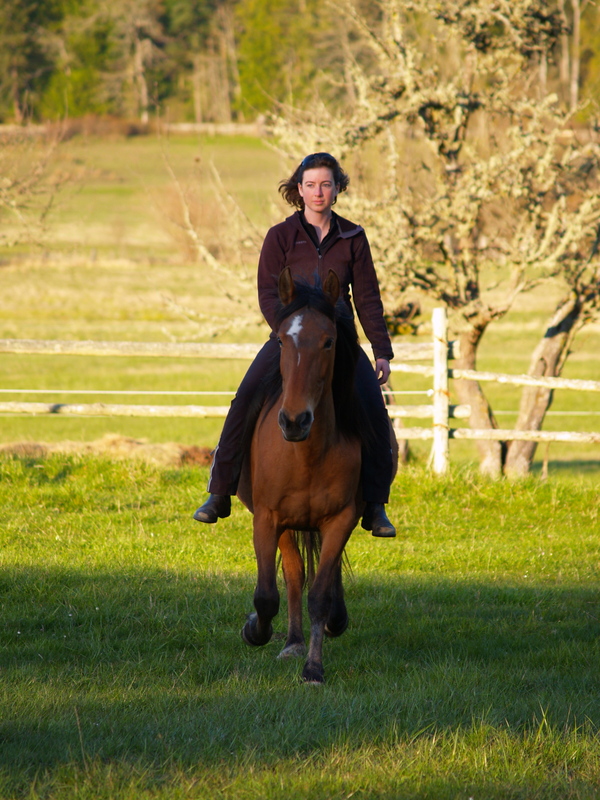 Training horses is always a balance between motivating them to move, while at the same time keeping them focused enough on the trainer or the job at hand to keep everything under control. The faster a horse moves, the more exciting everything gets, and the harder it becomes for the horse to stay focused in the moment. The leaping, bucking, and bolting in excitement that can occur when a young horse is learning to maintain forward motion is something that may require a bridle to help refocus horse and rider together. Myrnah and I have no such luxury. The solution to the above potential problems is: Myrnah and I trained the stop first and we practice it constantly. 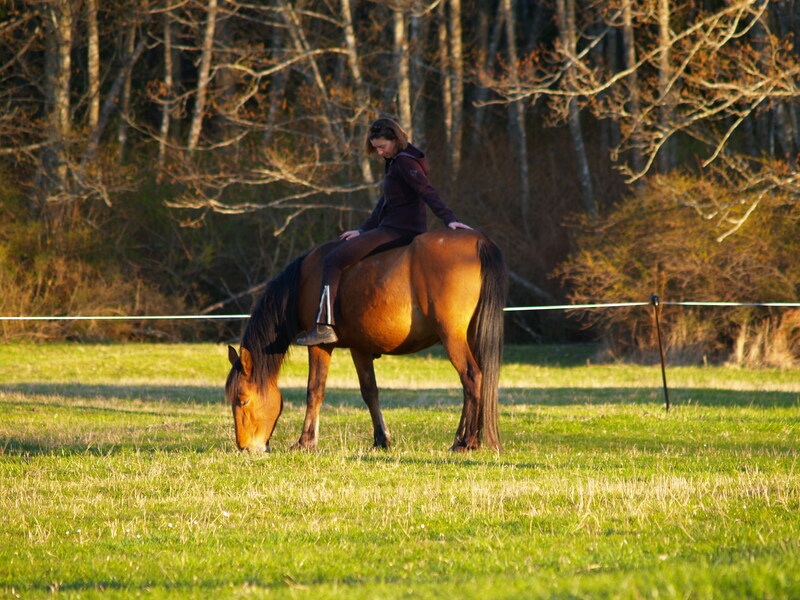 However, riding a horse at a stand still is not really what riding is all about. 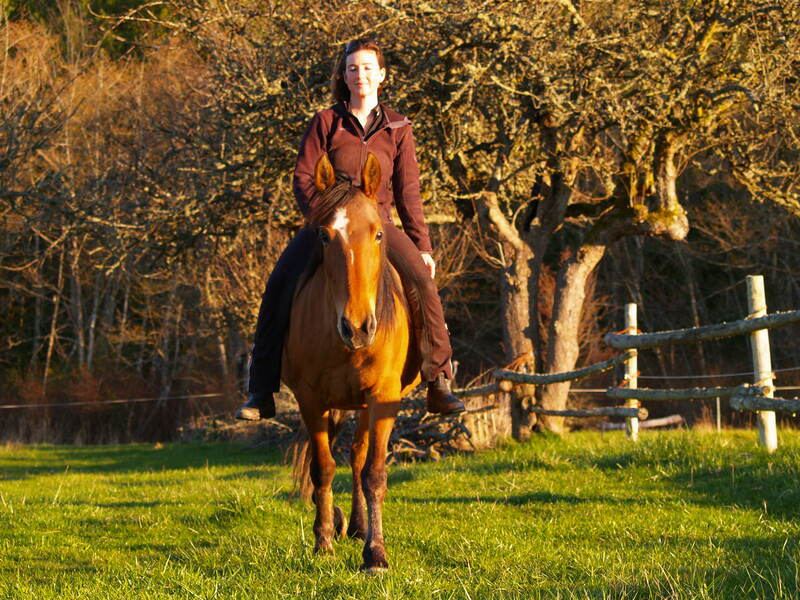 We want to move with our horses, that is where it gets fun. For safety, Myrnah and I have to maintain stopping as the number one importance in our training routines. Number two in importance, however, needs to be all about moving. This week Myrnah and I had some brilliant new fun with movement. Our jumping that I talked about last week grew into a love of running and playing together in our groundwork. 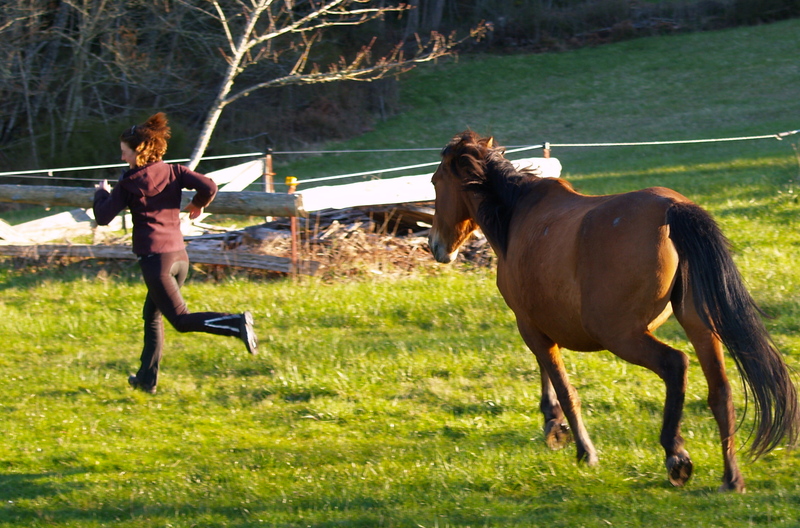 For the first time ever, Myrnah had a day where I could sprint off across the pasture, and she would come galloping after me, bucking and leaping and squealing with glee. Sometimes I wasn’t fast enough, and she would have to make a loop around me to play the air with her exuberance before coming in gently to touch my hand and take a grazing break, both of us panting as we lounged in the lush grass. The bold confidence Myrnah had to play with me like that, instead of running away, felt like the biggest gift. Though after awhile the game changed for her from fun to overwhelming, and, as soon as that happened, she chose to run back to her herd instead of to me. That is when I knew I had taken the game too far, or too long, and it was time to slow things down to baby steps again. I love that she had the freedom to choose, and she could tell me when she enjoyed the energy and when she felt it became too much for her. Riding and developing forward movement is a constant challenge for us. 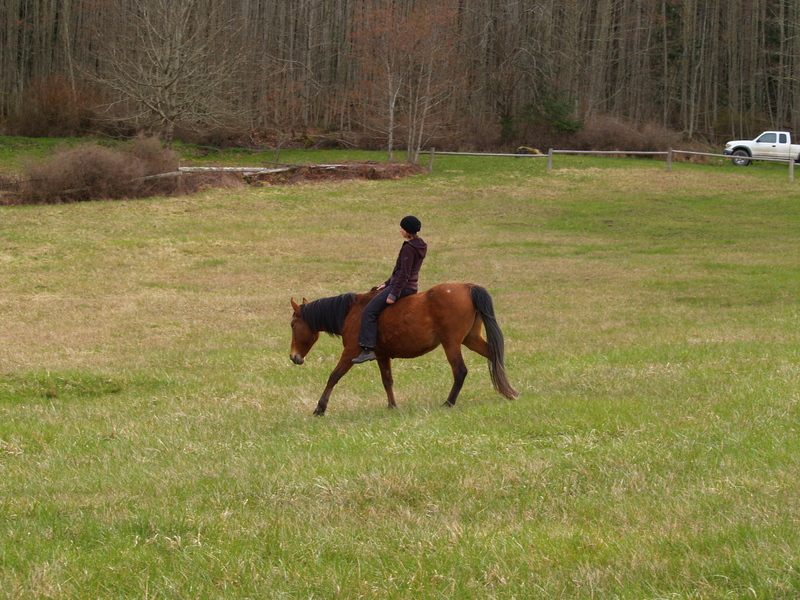 Myrnah would really rather just meander around and graze while I am riding. I would like to travel places. So we stop and start, and stop and start, walk and trot, and stop, and back up over and over, until Myrnah takes a deep breath and commits to moving forward until told otherwise; then I take a deep breath and ask her to bend around to a stop, touching my toe to connect in with me before I tell her it is okay to take a grazing break. Day by day our trots get longer and more relaxed in committed forward movement, and, each time we stop to graze, I choose a spot we haven’t stopped before so she becomes eager to travel new places with me. The first time we cantered, it was by accident. 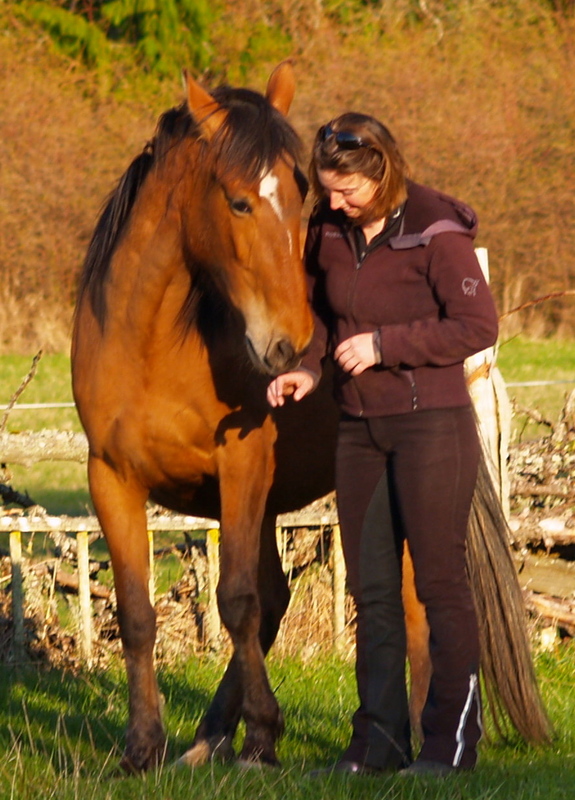 I had forgotten to put the cavaletti down to its lowest setting when I was riding; so, when Myrnah carried me over at the trot, her big pregnant belly made her clumsy and her back legs got tangled, flipping the jump up in the air and scaring her forward into a couple of strides of canter. 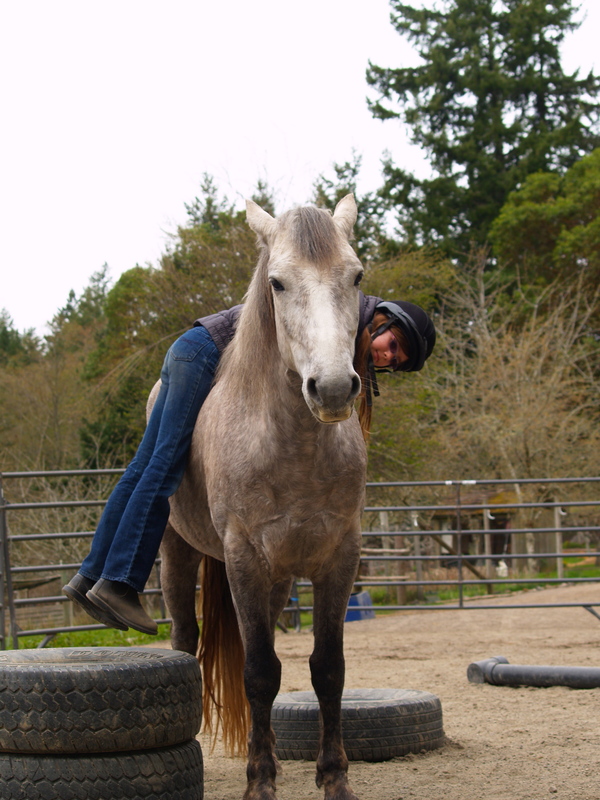 The wonderful part was that she didn’t take off bucking, or get scared into a bolt. Myrnah simply and quietly cantered two steps away, stopped, and reached around to touch me with her nose, checking in to see if we were all okay. I reassured her, and then we continued our ride as though nothing had happened. She is a little more cautious going over the jump now, but, other than that, we were all fine after our small adventure. Thursday this week, our trotting was taking us both up and down gradual hills in the paddock. 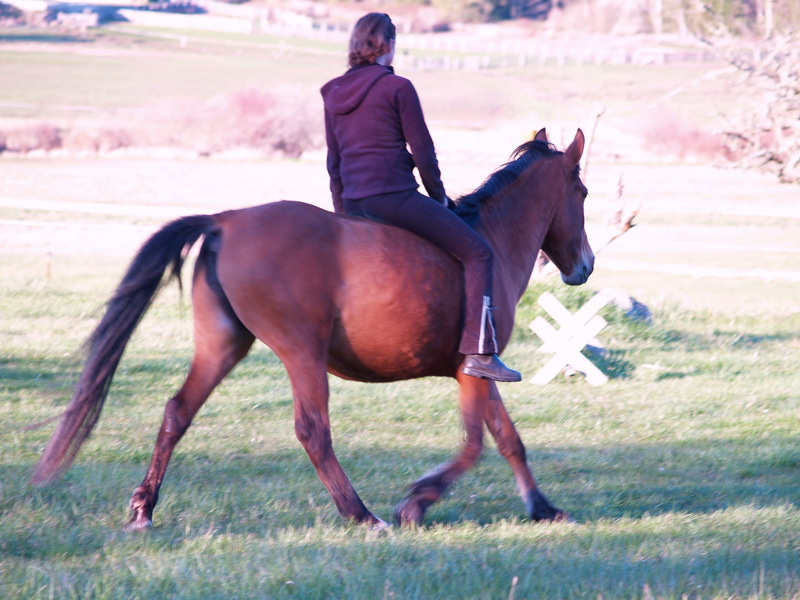 I am impressed with how balanced Myrnah is trotting down hill, and credit that partly to how many stops and backups she has spontaneously offered in the process of learning how to maintain her trot the last few weeks. All those transitions she needed to do for her confidence also developed her physical balance. While I knew that was the case, I also have to admit it was frustrating for me to have her stop and start so much while she was developing forward movement. In hindsight though, the pay off of an incredibly balanced, easy-to-ride trot, both up and down hills, was very much worth the time and effort it took to get there. 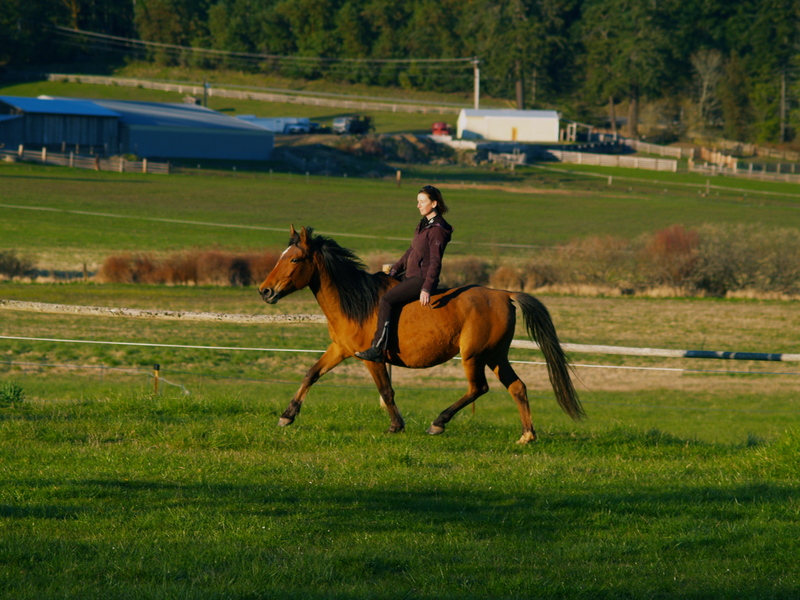 That balanced easy-to-ride trot is also what made it so effortless to add a little leg going up a hill on Thursday and rock gently into a canter. Four strides of lovely, easy, flowing canter and I vaulted off to lavish Myrnah with praise, finishing the ride then and there. Riding Myrnah at the canter on purpose and having it be that easy felt like a huge breakthrough to me. Ending the ride there hopefully helped Myrnah see how much I value her effort to do something new with me, just because I asked. Developing forward movement without a bridle or a round pen to contain the results takes perhaps a little more patience and quiet perseverance. So far, the results seem to be completely worth the extra time. I really had no idea Myrnah would be willing to canter with me quietly and easily this early in the game. Interesting how our progress can seem so slow and so fast all at the same time. Hmmmm, I wonder how close we are to developing forward into riding the gallop? I will keep you posted, and yes, I promise I won’t hurry. Developing forward is too fun to be rushed.